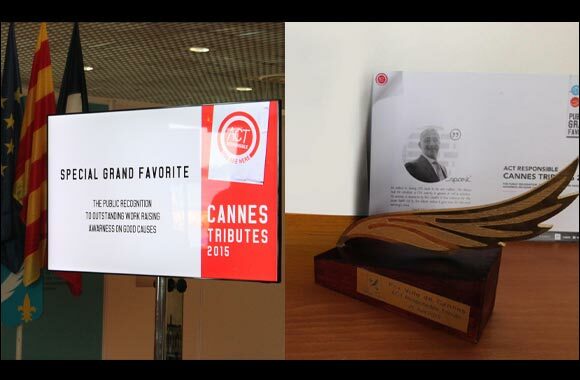 [Dubai, UAE, July 06, 2015] Dubai-based agency Spark* is celebrating a major double win at Cannes. The organisation - part of the Publicity Network - was awarded a Special Tribute and a Human Rights Tribute Award at the ‘ACT Responsible Tributes,’ an affiliated annual event part of the world’s largest and most prestigious awards festival for the marketing communications industry. Spark* scooped 2nd Favourite in the ‘Human Rights Tribute’ category for its TV commercial ‘Numbers,’ which formed part of a campaign in support of women. The category was one of four under ‘ACT Responsible Tributes,’ which recognises and celebrates creativity for good causes. Founded in 2003 by the former mayor of Cannes, Bernard Brochand, ACT Responsible Tributes forms a link between the citizens of Cannes and the festival, with its other categories being ‘Education,’ ‘Solidarity’ and ‘Planet.’ The entries shortlisted by the eminent jury in each of the four categories are then voted on by members of the general public and visiting Cannes delegates. Spark*’s Special Tribute Award was bestowed based on the overall performance and quality of its campaigns shortlisted at the Tributes in 2015, which this year included Dubai Community Development Authority’s ‘Young Masseuse’ activation and ‘You’re Nobody’ - a long copy ad for the popular television series ‘Everyday Heroes.’ This accolade is awarded to the agency judged to have had the most outstanding participation and votes across its campaigns. In collecting the Special Tribute Award for 2015, Spark* demonstrated its excellence by coming first in a field of 86 top agencies representing 33 countries. “It is an honour to have received two top awards at Cannes - the world’s most renowned event for marketing communications professionals. Both of these eminent recognitions are a testament to the creative and inspiring teamwork that we nurture and grow at Spark*. I would like to thank everyone at Spark* for their outstanding effort, commitment and dedication, and to our clients for giving us the opportunity to create communication for greater good. This magnificent achievement is proof that good never goes unrewarded,” said Yusuf Pingar, Managing Director, Spark*. This year’s twin awards for Spark*follows on from its success at last year’s ACT Responsible Tributes where the agency won the Grand Prix, also in the Human Rights Category, for a previous campaign for Dubai’s Community Development Authority.